A multi-institution international team led by researchers at Baylor College of Medicine has developed a new strategy to overcome one of the main obstacles in the treatment of brain cancer – access to the tumor. Under the influence of cancer, the blood-brain barrier diverts immune T cells that attempt to enter the brain to fight the tumor. The new discovery, published in the journal Nature, decodes the molecular cause of this immune escape mechanism and engineers T cells with a first-in-class molecule called Homing System that enables the T cells to cross the impervious cancer blood-brain barrier to effectively fight tumors. "T cell immunotherapy is an emerging field that has shown promise in clinical trials for cancer and other conditions," said senior author Dr. Nabil Ahmed, associate professor of pediatrics at the Center for Cell and Gene Therapy at Baylor College of Medicine. "However, effective homing of therapeutic T cells on the target site remains a major limiting factor, especially for brain tumors." In this study, Heba Samaha, the lead researcher from the Children's Cancer Hospital Egypt-57357 and the study team described a previously unknown 'escape mechanism' used by cancer cells to divert T cells from brain tumors. They accordingly genetically-engineered T cells to give them the molecular keys they needed to overcome this obstacles and cross this barricade into the tumor. "We reasoned that if we could understand how T cells in multiple sclerosis succeeded at infiltrating the brain, then we could probably engineer therapeutic T cells to cross the cancer blood-brain barrier and infiltrate brain tumors in very high density," said Ahmed, who also is a member of the Dan L Duncan Comprehensive Cancer Center at Baylor and the Texas Children's Cancer and Hematology Centers at Texas Children's Hospital. In contrast, in brain cancer the study team found that, to evade the tumor's demise, the blood-brain barrier blocks access to T cells that specialize in destroying the tumor. Specifically, Samaha and her colleagues investigated the changes in the cancer-associated blood-brain barrier that limit the T cells' access to the tumor and developed a strategy to overcome them. In multiple sclerosis, access through the blood-brain barrier follows a sophisticated well-concerted process. First, T cells engage ALCAM, an adhesion molecule overexpressed on the surface of the endothelium of the blood-brain barrier, loosely tethering the T cell to the endothelium in what is referred to as the "primary adhesion wave." After binding ALCAM, successful crossing requires that T cells sense a "secondary adhesion wave" created by more ubiquitous molecules, predominantly ICAM-1 and VCAM-1, to reach the 'tight' adhesion threshold needed to capture T cells from the bloodstream. "When we looked at the blood-brain barrier in brain cancer we found that, in a way similar to multiple sclerosis, the cancer-associated endothelium also overexpressed ALCAM, but by contrast, it reduced ICAM1 and eliminated VCAM1. This likely contributed to the tumor's escape from immune recognition by diverting T cells from the tumor," Samaha said. "The re-engineered CD6 molecule works like a 'homing system.' It strengthened T cell binding to ALCAM on the endothelium and also enhanced T cell sensitivity to the reduced levels of ICAM1 on the blood vessels associated with cancer," Ahmed said. "As a result, the T cell-cancer endothelium cell interaction mediated the capture of circulating T cells and their crossing across the endothelium to robustly infiltrate glioblastoma and medulloblastoma, the most common brain cancers in adults and children, respectively." "The results were very encouraging," Samaha said. "We observed that T cells with both the Homing System and CAR substantially shrunk tumors in all treated animals. In contrast, T cells without the Homing System homed poorly on the tumor and thus only transiently slowed down tumor growth. Rather importantly, Homing System-T cells were strictly directed to tumor sites, but not normal brain or other normal body tissues." "Next, we will test the Homing System platform in clinical trials and simultaneously engineer next-generation Homing System molecules for the targeted delivery of therapeutic or diagnostic cells to other diseases," Ahmed said. "We anticipate that the Homing System platform could be a gateway into brain pathologies, including both inflammation and cancer." 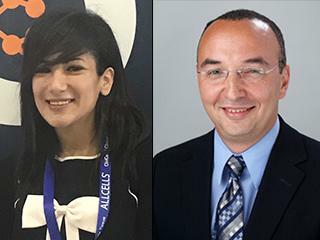 Other contributors to this work include Antonella Pignata and Kristen Fousek of the Center for Cell and Gene Therapy (CAGT) of Baylor College of Medicine (BCM), Jun Ren of Harvard Medical School (HMS); Fong Lam of Texas Children's Hospital (TCH) and Michael E DeBakey Veterans Affairs Medical Center of BCM, Fabio Stossi and Julien Dubrulle of the Integrated Microscopy and Advanced Technology Cores of BCM, Vita S Salsman (CAGT), Shanmugarajan Krishnan (HMS), SungHa Hong of McGovern Medical School University of Texas (UT), Matthew L Baker of the National Center for Macromolecular Imaging at BCM, Ankita Shree (CAGT), Ahmed Z Gad (CCHE and CAGT), Thomas Shum (CAGT), Dai Fukumura (HMS), Tiara Byrd (CAGT), Malini Mukherjee of the Center for Human Immunobiology (CHIB) of TCH and BCM, Sean P. Marrelli (UT), Jordan S Orange (CIHB, BCM), Sujith K. Joseph (CAGT), Poul Sorensen of the University of British Columbia, Michael D Taylor of the University of Toronto, Meenakshi Hegde (CAGT), Maksim Mamonkin (CAGT), Rakesh K Jain (HMS) and Shahenda El-Naggar (CCHE-57357). This work was funded by SU2C-St. Baldrick's Pediatric Dream Team Translational Research Grant (SU2C-AACR-DT1113), Alex's Lemonade Stand, NIH-T32HL092332, R01AI067946, T32GM08812, DK56338, CA125123, and 1S10OD020151-01. Further support was provided by CPRIT (RP150578) and the Dan L Duncan Comprehensive Cancer Center P01-CA080124, R35-CA197743 and P50-CA165962.